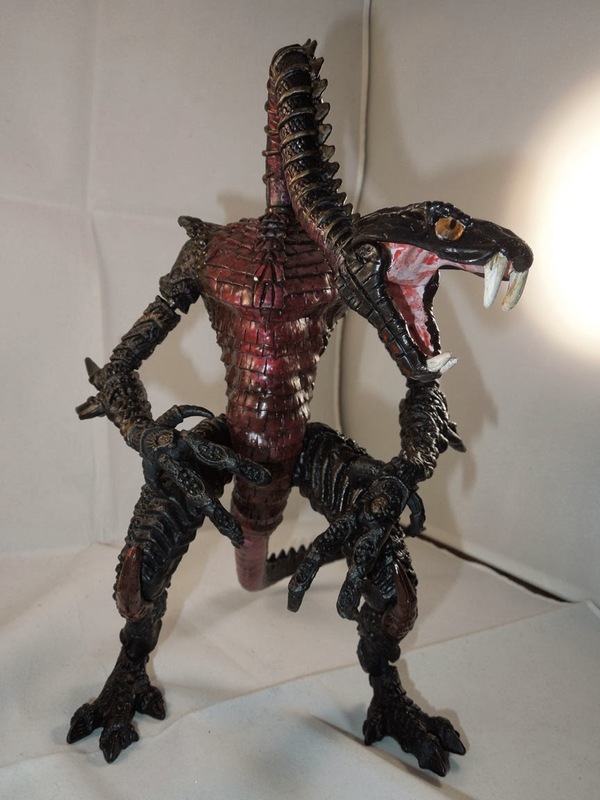 Septhera (plural), otherwise known as snake men, reptile-kin or lizardfolk, are a long extinct race that ruled over Aenya approximately twenty thousand years ago, or 10,000---9000 BGM (Before the Greater Moon). They are infamous for having enslaved the early race of man or protohuman. Traces of their civilization have been mostly lost beneath the sands of the Dead Zones. However, Shess, a prominent city now in ruins, can be found far to the west of the Great White Flat. Descendants of the Septhera are rumored to exist. Remarkably adaptable, these "snake spawn" alter their skin, much like a chameleon, to take on a more human appearance. Despised by the native races of Aenya, these progeny of the Septhera live in hiding as nomadic merchant traders, though some are hired as assassins due to their stealth and face changing ability. HISTORY: With little material evidence, what is known of Septheran history is conjecture, pieced together by pictographs found on ruin walls and fragments from the Ages of Aenya, the lost tome of Zo historian, Eldin. Despite the lack of knowledge, Septheran history is of crucial importance, as their past is inseparable from that of early man. The history of the Septhera is, in essence, the history of Aenya. Aeons ago, before history was recorded, when humans and halfmen shared many characteristics, there existed a civilization beyond this world, that shone among the stars like a pale dot against the sun. This world was wet, warm and tropical. Massive reptilian creatures, called saurians, dominated its landscape, and of these, two became self-aware. The first were the Xexaz, but so little is known of them that they are referred to by Eldin as the Forgotten. Xexaz were large, slow moving, and deeply curious about the nature of existence. But as they focused their acumen on their ever expanding understanding of the universe, their bodies deteriorated, and the lesser race, which valued strength, came to wage war against the elder. Stealing technologies they could not replicate or comprehend, the Septhera soon dominated the planet, and in doing so, doomed themselves to extinction. What they did not know was that their sun was expanding, and had been expanding for untold aeons. Only the Xexaz knew to keep the sun from scorching their world, but as the Septhera had slaughtered them to the last, intent on driving the elder race to extinction, their only recourse was escape. In a massive ship, the Ark, the Septhera gathered those of royal blood and their servants, along with the giant saurians they most valued for meat and labor, and set to the stars in search of a new home. When the Ark landed upon Aenya c. twenty millenniums ago, the Septhera found a primitive world, far different from what is known today. Only the merquid, who dwelt in vast coral cities spanning planet-wide oceans, could contest them, but being elusive creatures, the merquid paid the newcomers little mind. The protohumans on the land, however, were simple hunters and gatherers. They did not wear clothes or build shelters. They knew only to make fire, to bury their dead, and to use simple tools like the spade and the hoe, and weapons like the spear and the atlatl. Primitive and scattered, the protohuman was no match for the Septhera, who were physically stronger and faster, and armed with steel. For centuries, men and women were herded like livestock, forced to do labor and fight for entertainment. At times, they were used as a food source. It was not until a man known as Batal, who was made to battle a Septheran prince, did the protohuman revolt en masse. 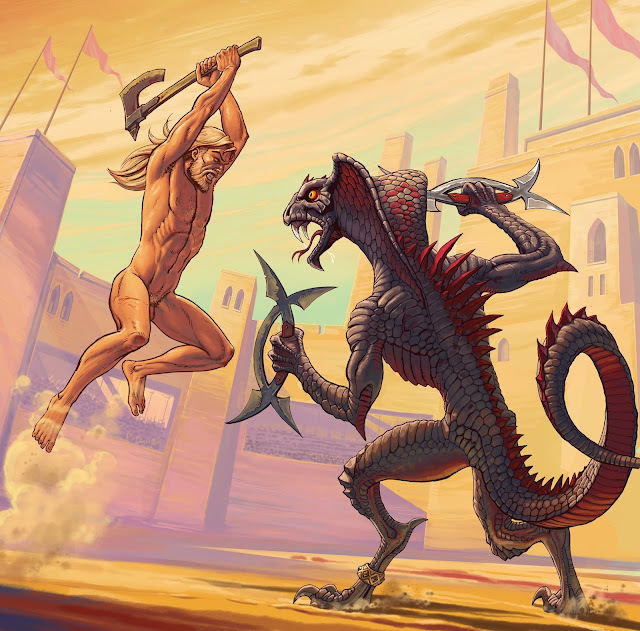 Martyring himself to defeat the greatest of their race, Batal proved humans capable of overthrowing their masters. Once organized, the Septhera were overwhelmed by superior numbers, and when the last of their kind, their Pharaoh, was slain, the newly united race declared themselves, "free from slavery and death." A new age had begun, The Age of Life, and the people came to be called the Zo, a word meaning "Life." PHYSICAL ATTRIBUTES: The Septhera vary in appearance greatly, but all have scales, elongated and flexible necks that can turn in a complete circle and move independently from the torso, and tails between half and double the length of the body. Females stand between 5' and 6', while males can grow up to 8' with neck extended. In hue, Septhera range from black, green, red, and purple, or they can be multicolored. Their fangs grow from 3" to 9". Stripes, ovals and diamond patterns along the arms, legs and tail are common among females, the more colorful, the more attractive to a male. Though smaller, females are just as agile and deadly. Septheran royals are identified by their hoods, a membrane that expands from the head and neck, and are the only of their kin to produce natural venom. Death by venom, the purple death, is quick and painful. Bony ridges and hard scaly protrusions define the lesser castes. While clothing is unknown to the species, Septhera adorn themselves in elaborate ornaments of gold bangles, necklaces, or tattoo like plating implanted directly onto their scales. Their weapons are finely wrought and deadly works of steel, curved like their teeth, including daggers, scythes, sickles, khopeshes, and the moon blade, named after the waning crescent of the moon. Physically, Septhera are stronger and faster than humans; they are also ambidextrous, and can jump from a standing position up to 15'. Despite these advantages, their lack of imagination and inability to organize served their downfall. CULTURE: Females abandon their eggs in sand. A Septheran comes into the world alone and fights for survival from birth. For this reason, they are incapable of compassion, or of understanding the suffering of others. Mating between Septhera is a brief and often violent affair, and it is not uncommon for males to be killed in the process. Their only respect is for power, and so their society revolves around a power hierarchy. The lowest caste are workers and slavers, followed by warriors, with royals sitting at the top. Status is attained by killing someone of equal or higher status, which is why those of the royal caste must continually prove themselves worthy in battle. This is why, it is believed, when a lowly human (Batal) managed to slay a royal and prince in battle, the social hierarchy was thrown into chaos. And Man bowed to them. Very cool, Nick! I think you captured the sociopathic nature of the Septhera perfectly. That combined with their deadly physical form certainly makes for a nightmarish breed.